Boondock hill country of Pine Gap, Missouri 1885 In my previous review, for book #2, At Love’s Bidding, Betsy Huckabee is a young girl from the hills who has GREAT insight. She is spunky, outspoken and very protective of those she cares about. In this book, she is all grown up and is a local reporter for her uncle’s newspaper. She has a desire to become a journalist for a major paper someday. She believes herself to be married to her career, and has carefully avoided suitors up to this point. Deputy Joel Puckett, from Texas, has been transferred to the tiny town of Pine Gap, and quickly decides it needs his expertise to gain control over the criminals that have been terrorizing the town, along with the local vigilantes trying to protect the town through less than legal means. Joel carries a secret with him, that has forced him to leave Texas, and he is in no mood for the headstrong reporter who has decided she wants to shadow his every move. Plus, the townspeople seem less than interested in welcoming a newcomer. While it’s been agreed they will provide a horse for him, the tiny pony awaiting him does not exactly command respect. Betsy is excited to finally have someone new from which to draw on for her stories, so she decides staying close to the new sheriff is her best bet. However, she also has a responsibility to her uncle’s family, where she feels like an outsider taking advantage, being that she is a full grown woman, and still living under his roof. If she can just use the new sheriff for inspiration, maybe she could make some money selling fictional stories to a larger paper. She soon finds there is much more to Joel Puckett than inspiration, and he finds there is more to the strong-headed local girl than just being a nosy, in-the-way reporter. 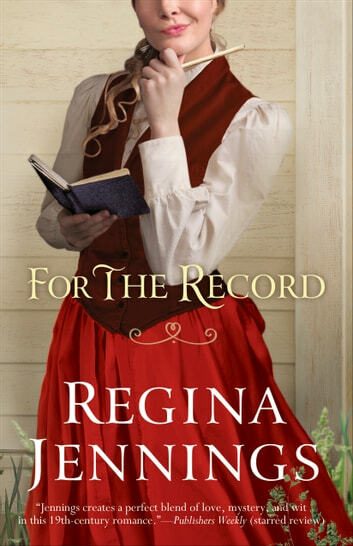 I enjoyed this historical, Christian romance, that weaves wit and mystery into the story, and recommend it to others. THIS IS BOOK #3 © 2016 Bethany House 329 pages I received a copy from the publisher, in exchange for my honest review. Deputy Joel Puckett has left behind his beloved Texas after being falsely accused of taking advantage of a woman and is looking for a fresh start in Pine Gap, Missouri. He soon finds his new job has plenty of challenges—old feuds, lawlessness, a sheriff who isn’t inclined to stop criminals, and a gang of hooded riders set on carrying out vigilante justice. No one seems to want him there, except maybe Betsy Huckabee, but since he wants nothing to do with women, she’s just another obstacle to him succeeding in his new position. Betsy can’t help but notice the new deputy’s good looks, even if he doesn’t have the personality to match. While he always seems to want to be rid of her, she keeps tabs on him because in him she sees the way to gain independence from her family: she’ll embellish stories about the Dashing Deputy for a serial newsletter column. But as Betsy writes about the Dashing Deputy, she comes to see that the real Joel Puckett might be even better than the Dashing Deputy she has imagined—and he might be just what she and Pine Gap really need. This is the third book in a series, but you don’t have to read the others first (I didn’t…but I will go back and read them now!). I wasn’t familiar with Pine Gap or the feuds and trouble with outlaws that presumably were covered in the previous books, and I don’t know if I’ve ever read anything that takes place in the Ozark Mountains (other than Where the Red Fern Grows), so it did take me a couple chapters to feel comfortable with the setting and context of the story. Once I felt a little more settled, though, I was intrigued by the setting. The characters intrigued me from the beginning—Betsy is funny and refreshing and just determined to do what she wants to do, while I couldn’t help but feel bad for Joel, who had been falsely accused in his old town and is resented and unwanted in his new town. I really liked some of the secondary characters, too, particularly Clive Fowler, who is the leader of the vigilante group; he is really an interesting character because while he’s working against Joel because he takes the law into his own hands, he does so because he’s trying to keep people safe. He’s a great character for making you think about justice, morality, following the law, and what it means to do what’s right. The plot was fresh—not the same old story that I’ve read a lot of times. The idea of Betsy romanticizing Joel for the purpose of her fictional article was funny, as were Joel’s determination to stay away from her and some of the things he said to her as he tried to accomplish that. The conflict between them, when it came to a head was different than a lot of stories, because instead of just assuming that everything wasn’t going to work out, they gave each other the benefit of the doubt pretty quickly and didn’t just write each other out. I liked that; there really was a problem and hurt feelings and confusion, but instead of just avoiding each other or something, they worked together and fixed it pretty quickly, without months and months of brooding or something. This is an enjoyable story from Regina Jennings. I can’t wait to read more of her books! I received a free copy of the book from the author and Bethany House. All opinions are my own.